More than 11,000 girls have taken part in a mass Hindu prayer ceremony in western Nepal, which organisers say is one of the biggest of its kind ever to be held in the country. 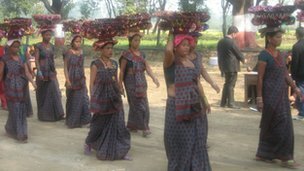 The traditional Kanya Puja ceremony honours girls as incarnations of the Goddess Bhagawati. It included girls from different ethnic communities and castes. Organisers say the aim is to dismantle the caste system and spread a message of equality and social harmony. Many girls taking part in the ceremony at Ramnagar in Nawalparasi district wore school uniforms and performed Hindu devotions and chants. "It is our Vedic tradition to offer Puja [Hindu devotions] to kanya [girls] who are regarded as incarnations of Goddess Bhagawati," festival organising chief Bharat Raj Poudel said. He added that the Puja was being done in a manner to bring about "social revolution" by ensuring a more inclusive society and discarding discriminatory caste traditions such as "untouchability". "We want to do away with ethnic discord," Mr Poudel said. Nepal has recently witnessed ethnic unrest amid heated debate over the composition of a new constitution. Members of parliament remain divided over the issue. Some ethnic communities, mostly from indigenous groups called Janajati, have called for the country's provinces to be demarcated along on ethnic lines. They have also opposed what they have described as the integration of high-caste Hindus - such as Brahmins and Chhetris - into "the body politic". The Kanya Puja is to be followed by the two-week-long Mahayagya - another Hindu ritual which is typically performed by priests using fires to carry out symbolic sacrifices. The main objective of the Mahayagya, according to organisers, is to preserve Hindu traditions, philosophy and values of life. Priests from neighbouring India have been invited to this programme. Formerly a Hindu kingdom, Nepal was transformed into a secular republic six years ago.